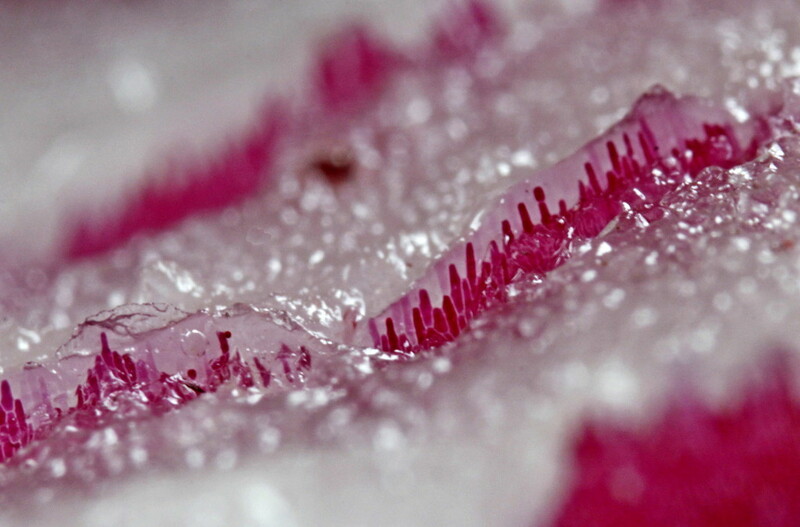 A slice of red onion, in the bottom left you can even see the liquid which squirts & makes our eyes water. Wow - you are having serious fun here!! @fbailey Indeed yes. I'm pretty sure I'll keep the camera but insect egg time (May onwards) will be the real tester. The more I learn now, the better, hopefully, the important photos will be. @featherstone26 I am becoming very impatient for insect eggs, what detail will be revealed I wonder. You are just having too much fun! I love your onion! A very creative shot! Fav! The macro world is so interesting. @stillhappysnap Thank you very much. I'm astonished at the detail. The concept of reverse lens is absorbing. @gaylewood Thanks, Gayle. I'm learning such a lot playing with this technique. Excellent macro.... one for me to try. Which lens did you use in reverse? @rookynook Thanks for the comment & for deciding to follow my erratic progress. The camera I have borrowed is a Canon 600d with its kit lens an 18-55. The reversing ring was £7, worth it because it makes life easier in what is to wobbly me, a difficult technique. This is great! I've loved your reverse lens pictures. I am definitely going to get into this and buy one! Thanks for the info. @emma78 I look forward to seeing what you do. Good luck.